MassDOT has announced that the upcoming project to make roadway improvements to Morton Street (Route 203) and the intersections with Gallivan Boulevard and West Selden Street in Boston is being advertised for construction bids. Bids are scheduled to be accepted through Jan. 8, 2019, at which time all of the bids will be opened. A winning eligible bidder will then be identified and a contract will be awarded, and work-related activities would then likely begin later in 2019. "We are pleased to be moving forward with the project to make improvements along Morton Street and at these two intersections so that pedestrians, bicyclist, motorists, and public transit users will have an easier time reaching the places they need to go in this area," said Highway Administrator Jonathan Gulliver. "We have appreciated the input and support from our state and local partners and members of the local community throughout the planning and design phase, and we look forward to selecting a contractor and beginning construction operations." "I want to thank the Baker Administration and MassDOT for their commitment to this project, as well as my colleague Representative Dan Cullinane and the residents of who worked hard to bring about this major community improvement," said State Sen. Nick Collins. "I look forward to seeing these substantial safety improvements at this dangerous intersection." 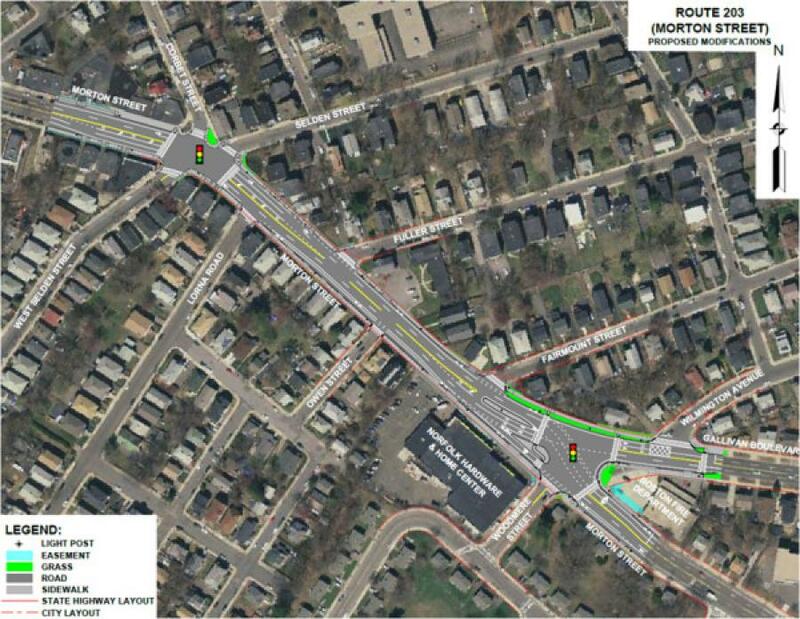 "This is a significant step forward on the comprehensive public safety improvement projects at the intersections of Gallivan Boulevard and Morton Street, and the intersection of Morton Street and West Selden Street," said State Rep. Dan Cullinane. "The intersection of Morton and Gallivan has been one of the most dangerous intersections in the entire city of Boston with separate and merging traffic patterns at high rates of speed next to a school, a large local business and a fire station. I am proud that we, as a Dorchester/Mattapan delegation, were able to fight for and deliver the $3.5 million in state funding being used for the upcoming roadway reconfiguration and traffic signal installation which will convert this very dangerous stretch of road into the safe intersection our community deserves." This future project is designed to increase access and improve safety and travel for all modes of transportation along Morton Street including public transit users, bicyclists, pedestrians and drivers. Improvements at the intersection of Morton Street with Gallivan Boulevard will include realigning the roadway and adding traffic signals and raised medians. A new traffic signal and protected left turn lane will be installed at the intersection of Morton Street and West Selden Street, along with new exclusive left turn lanes on Morton Street. Bicycle lanes will be added along Morton Street between West Selden Street and Gallivan Boulevard, and sidewalks will be reconstructed. Traffic signals located at the Morton Street intersections with Norfolk Street, Evans Street, West Selden Street and Gallivan Boulevard also will be optimized as part of this project to increase efficiency and improve pedestrian travel. Construction is currently expected to be carried out in four phases: roadway widening, proposed island construction, sidewalk construction and final paving. Access to this area is expected to be maintained throughout construction operations, and as always, work will be conducted in ways that minimize the impact on the local community and traveling public.